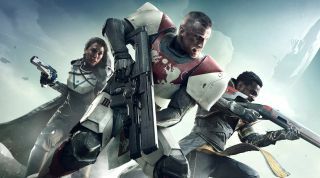 Destiny 2 is coming to PC, but PC gamers missed out on Bungie's masterpiece the first time around, and will rapidly need to get up to speed to experience the joys of Destiny 2. Fear not, this intensive crash course in Destiny lore, characters and enemies, will quickly acquaint you with all the key information necessary—not only what you'll need to talk like a Destiny veteran—but also setting you up as an essential primer for Destiny 2. Destiny's mythical sci-fi universe began in a Golden Age, some 700 years hence, where mankind had spread out amongst the solar system, sponsored by the arrival of the Traveler, a benevolent roving space-born entity which manifested itself as a giant white sphere, and which took humanity under its wing. This utopia was eventually ended by a mysterious cataclysm "The Collapse", which saw man's outer colonies destroyed by the hand of the Traveler's ancient nemesis, a force known only as The Darkness (no, not this one). Mankind took shelter in The Last City, its final stronghold on Earth under the protection of the Traveler, while a number of hostile alien forces like the Vex, the Cabal, the Hive, and the Fallen, occupied its former colonies and even parts of Earth itself (see adversaries section for full details). Destiny began when you, a fallen Guardian—one of Earth's last protectors— were awakened by your Ghost, an AI companion, in an ancient Russian cosmodrome. Your first major choice was how to continue the fight as one of three distinct classes: the swift and agile Hunter (think rogue), the powerful tank-like Titan (fighter) or the mystical force-wielding Warlock (magician). Decision made, you soon joined your fellow Guardians wielding Traveler-endowed Light powers, an absolute megaton of advanced weaponry and exotic armor, and wielding signature specials attacks like the Golden Gun, to battle these hostile alien threats and reclaim mankind's heritage. Destiny's storyline is quite complex and weaves around like a comet circling a black hole, but the core plot can be boiled down to these essentials. Beginning in that abandoned cosmodrome in Old Russia, you soon discovered the existence of Rasputin, an ancient AI warmind who seemed to be working toward some unknown purpose (though as you can guess, it was probably up to no good) which eventually unravelled into a sinister plot to prevent the Traveler ever leaving Earth. Launching into orbit and exploring the solar system for the first time in your newly acquired spaceship, you hot footed it to the moon and defeated a plot by the primary servants of the Darkness, the Hive, to siphon power from the Traveler. You also helped destroy a beast of a mega weapon known as the Sword of Crota, which you also (all too briefly) wielded to scythe down the encroaching Hive legions. Next stop? The sweating jungles of Venus and a battle against the Vex, a race of humanoid robots whose foul birthplace, the Black Garden, was preventing the Traveler from healing after the damage caused by the Hive. Following the Vex's machine-like trail led you to the Reef, a debris field in the Asteroid belt, where you encountered its ruler, Queen Mara Sov, who was willing to trade you the location of the entrance to the Black Garden, in return for the small matter of a Vex Gate Lord's head (no small feat given the Zydron, Gate Lord in question, was a lethal towering mechanical monstrosity). Taking the Gate Lord's head was one of Destiny's first monumental boss battles, but it opened the way to the arid sands of Meridian Bay on Mars, as you tried to discover the actual entrance into the dread Black Garden itself. However, the Cabal, a belligerent warrior race as foul tempered as the grumpy space rhino they resembled, were already busily probing the Black Garden's Gate for their own dark purposes. After breaking through their Exclusion Zone, you were finally able gain entrance using a rather macabre "key" fashioned from the fallen Gate Lord's eyeball. Visiting the Buried City underneath Meridian Bay, you discovered another AI controlled by the mysterious Rasputin, and were finally able to gain access to the Black Garden itself. Finding yourself in a place beyond time and space, you then penetrated deep into the Black Garden's heart, where you confronted three Vex Sol Progeny (enormous Minotaur-like bosses with a thirst for Guardian blood) known as Eschaton Mind, Imminent Mind, and Primeval Mind. After a colossal struggle, that trio were eventually vanquished and you were finally able to dispatch the Vex Heart to the oblivion it deserved and return to the Last City where a hero's welcome awaited! Not so fast Guardian, the job wasn't quite done yet, for that escapade only opened up the Vault of Glass, Destiny's first great raid, where you joined forces with up to six fellow Guardians and plunged into the Vex underworld to defeat its fearsome custodians. Fighting your way through the Gorgon's labyrinth (every bit as daunting as it sounds), you and your teammates confronted and defeated Atheon, a legendary Vex Conflux, a massive machine overseer with an extreme attitude problem, to finally complete Destiny's first great campaign. Destiny's storyline was then continued in two smaller expansions while sufficed as tasty aperitifs while players waited for full, meatier content drops. The Dark Below featured the Hive race and their dark deity, Crota, (whose sword you'd borrowed earlier in the main campaign) who you took down in a fittingly named raid entitled Crota's End, using a powerful artifact called the Chalice of Light. House of Wolves, focused on the Fallen and Guardians' battle to foil Skolas, Kell of Kells' plan to unite his people under his iron rule, with the powerful Skolas finally dropping before your guns in the triumphant Prison of Elders raid. The Taken King was Destiny's first great standalone expansion and took place in the chill depths of interstellar space on board the dreadnought of Oryx, the taken king, who was the father of Crota and understandably a bit miffed, after you'd killed his favorite son. The Taken King also introduced new Guardian subclasses for you to explore and a giant new raid, appropriately called King's Fall, before you ensured Oryx finally bit the dust. Rise of Iron was Destiny's final expansion which focused on the Fallen, who had sneakily acquired the SIVA nanotech virus and were now using it to pose a major threat to Earth itself. Lord Saladin Forge, one of The Last City's legendary Guardians organized the fight back, hoping to create a new generation of Guardian Iron Lords in this demanding expansion, which introduced the Plaguelands patrol zone and the ultra challenging Wrath of the Machine raid. While there are plenty of enemies waiting for you in Destiny 2, you can also call on some powerful allies to aid you in the fight to restore the Traveler and reclaim the Light. Manifesting itself as a huge white sphere that hovers over the Last City, the Traveler preserved life on Earth during The Collapse—the fall of mankind's outer colonies into darkness and provided Guardians with "Light", a range of powers to battle the encroaching Darkness and its minions. Ensnared by Dominus Ghaul and the Red Legion, the Traveler's powers have now faded and freeing it will be a high priority for Destiny 2. The mouthpiece, human face and interpreter of the Traveler's will, the Speaker lived in the Last City and provided guidance and instruction for Guardians in the dulcet tones of the incomparable Bill Nighy. Ghost is a hovering AI drone which accompanies Guardians on their adventures and provides commentary, help and advice in-mission, as well as hacking various doors and consoles. This mysterious stranger is a sentient war machine that seems inordinately interested in your Guardian's fate. Often glimpsed observing your progress, her motives remain unclear, but she will often make timely and crucial interventions with vital intelligence to help you survive. The Vanguards are three high-ranking Guardian elites chosen as paragons of their class, after forging a formidable fighting reputation in the Crucible. They all provide unique items and armor for each Guardian class and are set to play an important role in Destiny 2's story. Human Warlock Vanguard Rey has a reputation for being both intellectual, outspoken and not a little scary, and was renowned for flying solo reconnaissance missions before taking up the Vanguard mantle. She provides armor and emblems for the best and brightest Warlock Guardians and is often to be found deep in study, analyzing potential threats, although rumors she can turn anyone who displeases her into a frog, are believed to be that—just rumors. Awoken Titan Vanguard Zavala is a solemn individual whose role was organizing the defence of the Last City and masterminding its overall military strategy. A pupil of Lord Saladin Forge and a veteran of the Battle of the Twilight gap, his role is to provide Titan Guardians with armor and emblems, but since the invasion of the Red Legion, he is suffering something of an existential crisis over his failure to protect the Traveler. Hunter Vanguard Cayde-6 is an Exo, a humanoid war machine, voiced by the irrepressible Nathan Fillion and is loud, brash and boastful, but he's an impressive gunslinger and dead-eyed wielder of the Hunter's signature weapon, the Golden Gun. Hunters seeking specialist armor, engrams and some killer quips are advised to seek Cayde-6 out. Rahool is an Awoken and was the Tower's Cryptarch, as well as being a historian and scholar. He is able to decode engrams into useful weapons and equipment and also buys any curiosities Guardians discover during missions. Xur is a trader and Agent of the Nine whose seemingly random appearances are in fact dictated by planetary alignments. A handy Jovian to know, he will trade rare goods and exotic items for any strange coins Guardians find, but one of the most common questions you will find yourself asking is, "Where's Xur?" A race of powerful, bulky warriors with a rhinoceros-like appearance, the Cabal are a martial species, winning territory through might and conquest and have made Mars and Phobos their primary bases. Fierce and territorial, they burrow deep into mountainous territory to establish their strongholds and are led by an emperor, although it is the tank-like Primus and Dominus who command the battlefield. Their slave-like Psions also use unique powers of the mind to launch fearsome psychic attacks. Led by Lord Dominus Ghaul, the Cabal of the Red Legion are your main foes in Destiny 2. Renowned as scavengers and salvagers, the Fallen or Eliksni are an insect-like race who covet the Traveler's powers for themselves, after encountering it near the original home world. They worship beings known as Servitors and are organized into various noble houses, each ruled by a powerful lord or Kell. The Fallen are to be found primarily on Earth, the Moon, and Venus, and number the Hive and the Vex as their greatest adversaries—after Earth's Guardians. New Fallen bases in Destiny 2 are rumored to be found on Jupiter's moon of Io. The skeletal Hive are an ancient race and scions of the worm gods, and they are the only species known to be in the direct employ of the Darkness, who they serve in deference to an ancient hellish pact. Burrowing deep into the surface of the Moon where they built the Hellmouth, they have also been encountered on some regions of Earth. Their rulers include Oryx, The Taken King, God-King of the Hive, and Crota, crown prince to the Osmium Throne, but Guardians are more likely to duel with their Knights, Wizards and Ogres out in the wilds. The cybernetic Vex are a race of living machines, who are seemingly able to live outside time and are inherently hostile to Earth's Guardians. Custodians of the Citadel and the Vault of Glass, they are usually encountered on Venus, though they also guard the entrance to the Black Garden on Mars. Connected to each other by a vast hive mind, their Hobgoblin units provide murderous suppressive fire whilst their fearsome heavy Minotaurs teleport in to deal extensive damage at close quarters. New Vex bases are said to be found on Nessus in Destiny 2. Taken form the army of Oryx the Taken King, and are comprised of troops snatched from each of the other factions to serve him, after being corrupted by the Darkness and twisted by Oryx's power. They are characterized by pronounced jerking movements, and their bodies burn with a macabre blue-white flame. Their aim is to enslave as many worlds as possible and it's doubtful we've seen the last of them after the Taken King's fall. The big baddie for Destiny 2 is Lord Ghaul, a Cabal warlord and leader of the Red Legion who, launching a sneak attack, destroyed the Last City, trapped the Traveler and cut Guardians off from their Light powers forcing them into exile in the European Dead Zone. Ghaul has colloquially become known as "Lord Gary" amongst the Destiny faithful, after a typically subversive piece of selective amnesia from Cayde-6. Get Game Ready with the NVIDIA GeForce GTX 10 Series and experience Destiny 2 on PC. For a limited time, when you buy an NVIDIA GeForce GTX 1080 Ti or an NVIDIA GeForce GTX 1080 graphics card, system, or laptop, you’ll get Destiny 2 at PC launch and Early Access to the PC Beta! Click to buy in the US. Click to buy in the UK. (*This is a limited offer running between June 13 - June 27 and is only available through select partners).